It's going to be an exciting night at the Armory in New York on Saturday as Hilary, Witty, and Sean set out to rewrite the GRC recordbooks in the 3000 at the Columbia Last Chance meet. Sean was originally entered in the 5000, but it turns out that Oregon Track Club's A team of Olympians and American Record holders is running the 5k in an attempt to obtain the World Championships qualifying time. Sean selflessly agreed to run the 3k instead in his final tuneup for the World Military Cross Country Championships in Serbia on March 16. Good luck to all! Please take a few minutes to enter your schedule on the GRC spreadsheet. It's important that you all do this for a number of reasons, including so that I have up to date information when I enter folks in track meets, and request comps for road races. If you want to discuss potential races, feel free to give me a shout. Putting your name on the spreadsheet does not etch your participation in stone, and you will be free to make adjustments to your schedule as needed, but for now, it's a helpful tool. Speaking of comp entries, our friends at Pacers have generously offered comps for the St Patricks Day 8k in DC on March 10. If you want to be considered for a comp, please let me know right away. There is a team competition with a cash prize, so if you're on the fence about which of the St Paddys day races to run, I'll nudge you in the direction of the 8k. We'll be at BCC on Saturday morning for a 10:00 start, so meet for the warmup at 9:15. I'll send details about the specifics of the workout shortly. We had several strong performances at Kirby's 5k on Saturday. Catherine, Lindsay, and Maura all ran well in their seasonal debuts, finishing in 18:01, 18:08, and 18:12 respectively. The men were led by Alex and Dave Wertz, who were also making their seasonal debuts, and who finished in 15:47 and 16:00 respectively. In addition, two athletes made impressive GRC debuts. Julie Tarallo, who ran 18:23 off of marathon training that has not included any work faster than 6:00 pace, was Patriot League 10,000 meter champion during her stellar career at Colgate. Ken Rayner, who ran 16:15 on Saturday, raced at every distance from 800 to the marathon during his collegiate career at Bentley, and he has great potential for growth. Both Julie and Ken will be great additions to the team. Welcome aboard! We still need a volunteer to serve as captain for Cherry Blossom. Don't be shy about stepping forward to accept this awesome responsibility. We're getting to the time of year when most of you will want to run a weekend workout if you're not racing. We'll have practice Saturday morning at BCC, so mark your calendar accordingly. As spring approaches, we're going to start encountering conflicts at BCC. It appears that we'll be fine through the end of March, but after that, we'll need a certain degree of flexibility with our workout schedule. Be sure to pay close attention to the workout emails, so you know when and where practice will be. We'll be at BCC for our normal 7:15 start, so plan to meet for the warmup at 6:30. The men will do 3 x mile, 4 x 800, all with a 2:30 recovery. This is a warning: I will post an assortment of GRC-themed trivia questions on the blog tomorrow morning around 9:00am. The post will include instructions as to how to play, but I wanted to give an advanced "heads up" to those who wish to partake. Sean Barrett ran an excellent race at the USATF Individual Cross Country Championships in St. Louis to place in the top 50. His 7th place finish among the military qualifies him to serve his country at the World Cross Country Championships in Serbia! 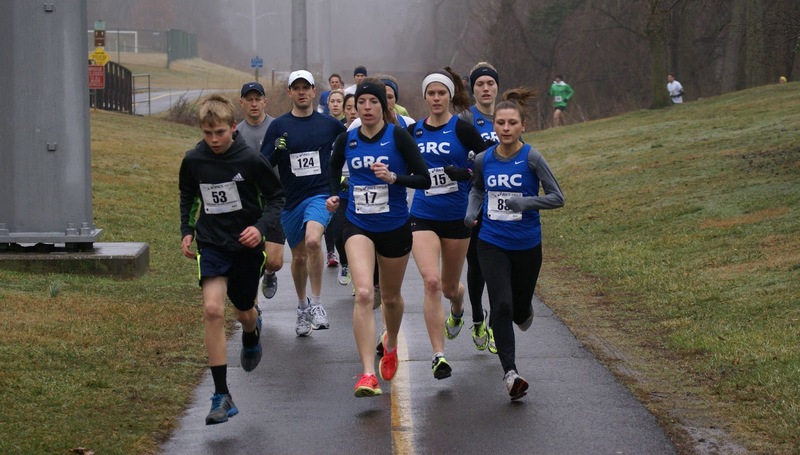 Back closer to home, the GRC swept the men's and women's open indoor miles at the PG Sports Complex.